Public Service Commissions of the both telugu states are conducting Departmental Tests to employees and teachers. 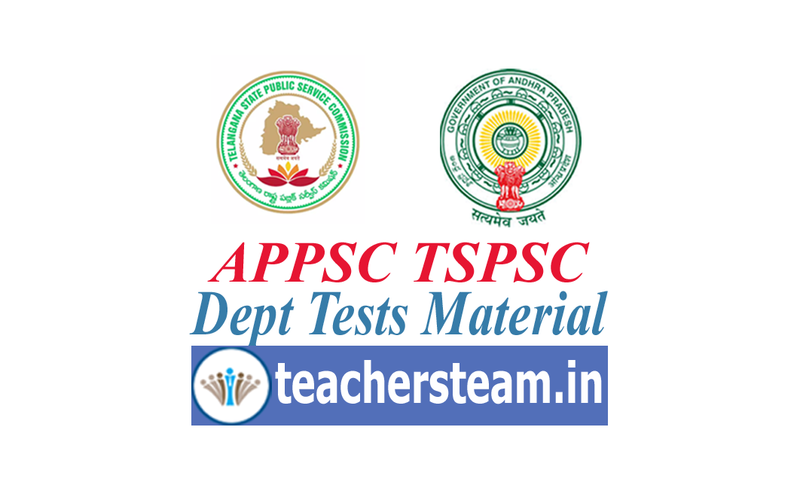 APPSC and TSPSC releasing the notifications to conduct the departmental test twice a year. So many employees are appearing departmental tests to get the promotion in their cadre. Andhra Pradesh Public Service Commission and Telangana Public Service Commission both the commissions are conducting departmental test in Computer based online test manner. Candidates have to go to the center allotted to them to appear the examination. There the officials will allow them to sit in front of the computer which is uniquely allotted to the candidate. to start the examination officials will provide the user ID and Passwords. After entering username and password candidate is allowed to solve the questions one after one. Questions and four options will be displayed on the screen in which candidate has to select one option among the four. Departmental Exams are multiple choice questions manner. so Employees and Teachers must prepare for it thoroughly. There some negative marks will be awarded for wrong answers. Hence the candidate who is going to appear Departmental Tests must prepare themselves well in advance with the good material available here under. Employees and Teachers can download the material for departmental tests. They can easily understand this material as this material is prepared by the teachers. Departmental Tests material is divided as per the paper codes. choose the material as per the required and start preparation.